2006 Harley-Davidson FXSTDI Softail Deuce. Picture credits - Harley-Davidson. Submit more pictures. Take a good long look at the lean, narrow design of the Softail� Deuce� and you see why no one else can build a motorcycle like Harley-Davidson. Raked-out fork. Chrome riser and low-rise handlebar. Straight-cut dragster rear fender. Hidden rear suspension. Comments: Stretched custom tank. Full-length, chromed tank console. Custom horseshoe oil tank and shotgun-style exhaust. Stretched, custom fast-back style rear fender. Chrome front forks, slider covers and risers with low-rise flat-track-style handlebar. Ask questions Join the 06 Harley-Davidson FXSTDI Softail Deuce discussion group or the general Harley-Davidson discussion group. Bikez.biz has an efficient motorcycle classifieds. Ads are free. 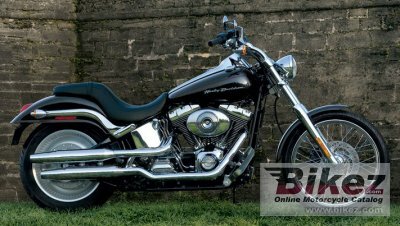 Click here to sell a used 2006 Harley-Davidson FXSTDI Softail Deuce or advertise any other MC for sale. You can list all 2006 Harley-Davidson FXSTDI Softail Deuce available and also sign up for e-mail notification when such bikes are advertised in the future. Bikez has a high number of users looking for used bikes. Before you buy this bike, you should view the list of related motorbikes Compare technical specs. Look at photos. And check out the rating of the bike's engine performance, repair costs, etc.